When some fishermen were out fishing on Long Island Sound recently, they encountered something that completely threw them off guard. When Rob Kurdy was out fishing with some pals, he got a real story for the books, and it has nothing to do with fish or sharks. In fact, it has nothing to do with aquatic life at all. While they were a ways out on the water, they spotted something bobbing about in the small waves. Once they decided to investigate and got a little closer, they realized that it was a deer struggling to stay afloat. The group eventually reached shore but the deer couldn't swim on his own, so Rob jumped into the water and carried him back to the beach. There, neighbors chipped in with blankets and jackets to try and warm the deer back up. Who knows exactly how he ended up so far out in the water — maybe it was a rip tide, or maybe he went in for a dip and started swimming the wrong way. But either way, he ended up in a really tight spot. 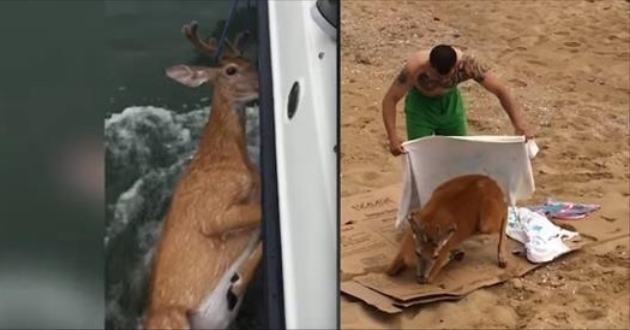 Responses to "Fishermen Rescue A Struggling Deer Six Miles Off The Shore"